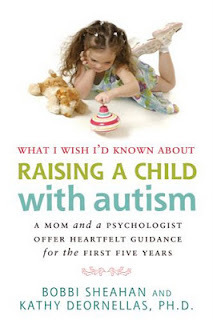 Life with Aspergers: Book Review: What I wish I'd known about Raising a Child with Autism by Bobbi Sheahan and Kathy DeOenellas PH D.
Book Review: What I wish I'd known about Raising a Child with Autism by Bobbi Sheahan and Kathy DeOenellas PH D.
"What I wish I'd known about Raising a Child with autism: A mom and a psychologist offer heartfelt guidance for the first five years", Bobbi Sheahan and Kathy DeOenellas PH D, Future Horizons Inc, 2011. This is a mother and psychologist writing team book with a difference. This time, the person with autism is female. The book in general is very well laid out and there is never any doubt as to which of the authors is writng at any given time. Bobby has written the majority of the text while Kathy, the psychologist writes less frequently and always in a grey box. There are scattered tips highlighted throughout the book and each chapter includes at least a few entitled "it bears repeating" or "what I wish I'd known". Bobbi's writing style is breezy, funny and engaging. She covers some very difficult topics and makes it clear that as a parent nothing is ever easy. Kathy tends to write on a whole different level and at times seems to have difficulty restraining the urge to cite all manner of research. Much of what she has to say is informative and supports bobbi's experience but I'd prefer to have heard things in her own words. There are one or two places where the authors get side-tracked by common myths about autism but they're minor quibbles. This is primarily a book written by a mother, for a mother. It's written from the outside looking in and it tells things as they seem. I was delighted to find Bobbi acknowledging this in a later chapter where she talks to her daughter about a long-past incident. Who hasn't had a child with asd's eat a lightbulb? I know I have. Bobbi's daughter, Grace's recollection of the incident highlights the fact that there was a lot more going on than was immediately obvious. It was a very touching moment in the book. The book is full of great ideas and indeed, I'm already sold on a couple. It's prompted me to change my thinking on a couple of common ASD behaviours. All in all, this book is a fun and breezy read packed with facts, experience and ideas. It's aimed at parents with children in the first five years of an ASD but I think it stretches much further than that. It covers not only the child with autism but also the need to look after the rest of the family and the problems of dealing with others who can't accept your child. Bobbi's journey to many of these realisations is difficult and we could all benefit from the lessons she learned along the way. I'd highly recommend this book to parents, psychologist and people supporting special needs children in general. "What I wish I'd known about Raising a Child with autism: A mom and a psychologist offer heartfelt guidance for the first five years" is available from Future Horizons, Amazon and Bobbi's Web Site (http://www.bobbisheahan.com/). My youngest took a lightbulb off our Christmas tree and ate it. It came out (still whole) in his nappy... and no, we didn't clean it and put it back on the tree. Bobbi's daughter however crunched a lightbulb... ...and she was older. Hopefully you won't have a lightbulb-eater. My dau, now 7, says that it was icky and felt like bees," which is why she spat it out. Well, of course.